Interesting Facts and information about King Richard the Lionheart of the Middle Ages who was famous for leading of the Third Crusade where he fought against Saladin, the Muslim leader. This article contains a Short Biography, Facts and History about the life of King Richard the Lionheart who was given the nickname 'Lionheart' in tribute to his great courage and honorable behaviour as a soldier. The brother of King Richard the Lionheart, John, attempted to usurp the English throne when the Lionheart was in the Holy Land which led to the legend and tales of Robin Hood. Richard and his brothers constantly fought with their father King Henry II who had incarcerated their mother, Eleanor of Aquitaine. When King Henry II died Richard was greatly grieved at his father's death. He visited Fontevraud Abbey Church and when he saw his father's dead body, he cried out, "Alas! it was I who killed him!" But it was too late and he could not make up for what he had done. King Richard I of England had to think about the Crusade he had promised to make. Richard was so brave and strong that he was called Lion-heart; he was very noble and good in some ways, but his fierce, passionate temper did him a great deal of harm. King Richard I and King Philip of France, and several other great princes, all met in the island of Sicily in the Mediterranean Sea, and sailed for the Holy Land. The lady whom Richard was to marry came to meet him in Sicily. Her name was Berengaria; but, as it was Lent, he did not marry her then. Berengaria went on to the Holy Land in a ship with his sister Joan, and tried to land in the island of Cypress; but the people were inhospitable, and would not let them come. So Richard, in his great anger, conquered the isle, and was married to Berengaria there. 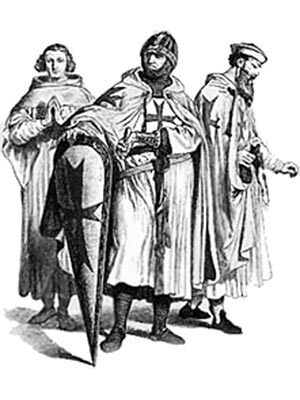 The Mohammedans who held Palestine at that time were called Saracens, led by Saladin, which means Splendor of Religion. Saladin was just, upright, and truthful, and his Saracens fought so well, that the Crusaders would hardly have won a bit of ground if Richard the Lionheart had not been so brave. At last, they did take one city on the coast named Acre; and one of the princes, Leopold, Duke of Austria, set up his banner on the walls. The Lionheart did not think it ought to be there: he pulled it up and threw it down into the ditch, asking the duke how he dare take the honors of a king. Leopold was sullen, and brooded over the insult, and King Philip thought Richard so overbearing, that he could not bear to be in the army with him any longer. In truth, though Philip had pretended to be his friend, and had taken his part against his father, that was really only to hurt King Henry. He hated Richard quite as much, or more, and only wanted to get home first in order to do him as much harm as he could while he was away. So Philip said it was too hot for him in the Holy Land, and made him ill. He sailed back to France, while Richard remained, though the climate really did hurt his health, and he often had fevers there. When he was ill, Saladin used to send him grapes, and do all he could to show how highly he thought of so brave a man. Once Saladin sent him a beautiful horse; Richard told the Earl of Salisbury to try it, and no sooner was the Earl mounted, than the horse ran away with him to the Saracen army. Saladin was very much vexed, and was afraid it would be taken for a trick to take the English king prisoner, and he gave the earl a quieter horse to ride back with. The Lionheart fought one terrible battle at Joppa with the Saracens, and then he tried to go on to take Jerusalem; but he wanted to leave a good strong castle behind him at Ascalon, and set all his men to work to build it. When they grumbled, he worked with them, and asked the duke to do the same; but Leopold said gruffly that he was not a carpenter or a mason. Richard was so provoked that he struck him a blow, and the duke went home in a rage. So many men had gone home, that Richard found his army was not strong enough to try to take Jerusalem. He was greatly grieved, for he knew it was his own fault for not having shown the temper of a Crusader; and when he came to the top of a hill whence the Holy City could be seen, he would not look at it, but turned away, saying, "They who are not worthy to win it are not worthy to behold it." It was of no use for him to stay with so few men; besides, tidings came from home that King Philip and his own brother, John, were doing all the mischief they could. So the Lionheart made a peace for three years between the Saracens and Christians, hoping to come back again after that to rescue Jerusalem. But on his way home there were terrible storms; his ships were scattered, and the ship of the Lionheart was driven up into the Adriatic Sea, where he was robbed by pirates, or sea robbers, and then was shipwrecked. There was no way for him to get home but through the lands of Leopold of Austria; so he pretended to be a merchant, and set out attended only by a boy. He fell ill at a little inn, and while he was in bed the boy went into the kitchen with the king's glove in his belt. It was an embroidered glove, such as merchants never used, and people asked questions, and guessed that the boy's master must be some great man. The Duke of Austria heard of it, sent soldiers to take him, and shut him up as a prisoner in one of his castles in order to hold him for ransom.. Afterwards, the duke gave the Lionhearty up for a large sum of money to the Emperor of Germany. All this time Richard's wife and mother had been in great sorrow and fear, trying to find out what had become of him. It is said that he was found at last by his friend, the minstrel Blondel. It is said that Blondel sung at all the castle courts in Germany, till he heard his master's voice take up and reply to his song. The Queens, Eleanor and Berengaria, raised a ransom to buy his freedom although his brother John tried to prevent them. The King of France did his best to hinder the emperor from releasing him; but the Pope insisted that the brave crusader should be set free and Richard the Lionheart came home, after a year and a half of captivity. King Richard the Lionheart freely forgave John for all the mischief he had done or tried to do, though he thought so ill of him as to say, "I wish I may forget John's injuries to me as soon as he will forget my pardon of him." Richard only lived two years after he came back to England, most of the time he was fighting battles in Europe. He was besieging a castle in Aquitaine, where there was some treasure that he thought was unlawfully kept from him, when he was struck in the shoulder by a bolt from a cross-bow, and the surgeons treated it so unskilfully that in a few days he died. The man who had shot the bolt was made prisoner, but the Richard the Lionheart's last act was to command that no harm should be done to him. The soldiers, however, in their grief and rage for the king, did put him to death in a cruel manner. Richard desired to be burned at the feet of his father, in Fontevraud Abbey and wished his body forever to lie in penitence. The figures in stone, of the father, mother, and son, who quarrelled so much in life, all lie on one monument now, and with them Richard's youngest sister Joan, who died nearly at the same time as Richard the Lionheart died, party of grief for him. Some interesting facts and short biography information about the History, Life & Times of King Richard the Lionheart. Additional details, facts, history and information about the famous Medieval Kings of the Middle Ages and important events during their times can be accessed via the Middle Ages Sitemap and the section detailing the life and times of the Kings of the Middle Ages.